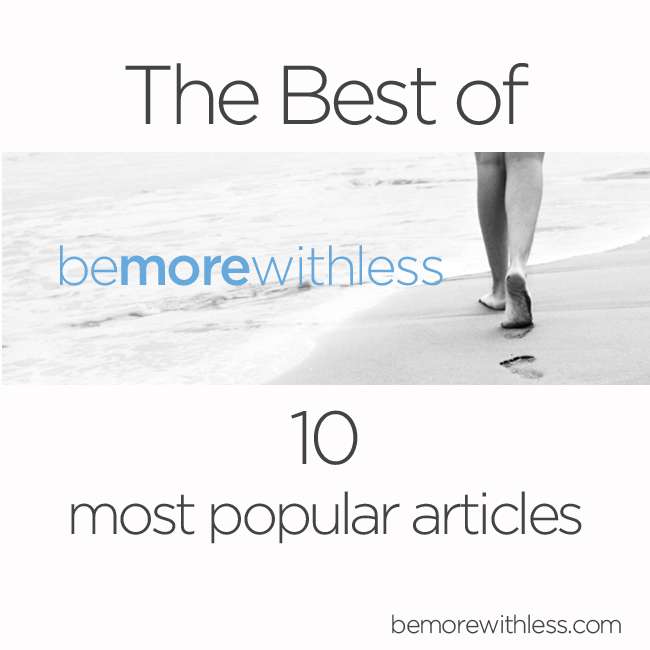 Over the past 5+ years, the Be More with Less archive has grown considerably. With 2-3 posts a week, there are now more than 600 simplicity articles. I’ll be pruning the archives in the near future, but today I am enjoying this body of work. Not only has it shaped the business I have now, but writing about my experiences has shaped my life too. Writing about and sharing challenges and simplicity strategies publicly has kept me accountable, and has inspired me to grow and change in ways I never considered. I chose these articles strictly by the numbers. (most visited in the past year) That means that they were either widely shared thanks to you, or Google really liked the topic. By the numbers, these are the best simplicity articles I’ve written. 1. 7 Tiny Steps for the Beginner Minimalist. I’ve become a minimalist slowly. I stepped in to minimalism, stepped out, moved forward, moved back and finally began to lean in consistently. 2. 25 Ways to Simplify Your Life in 10 Minutes or Less. Set a timer for 10 minutes. Choose any of the following tasks. Stop after 10 minutes. Then celebrate your simpler life. 3. The Story of the Mexican Fisherman. This story is my inspiration to slow down, reassess, and get real about how I want to live life. 4. How to Live in the Land of Enough: Create Space. One of the biggest benefits of living with less, is that you can quickly create space. More space will help you calm down and focus on what is important. 5. 7 Things to Do When You are Really Sad. In my experience, one of the benefits of simplifying your life is more happiness, or time to enjoy more happiness, but it doesn’t prevent sad things from happening. 6. 10 Ways You Can Have Enough Money and Stuff. It’s time to start asking the the tough questions, because it’s very likely that you are not living the life you desire. You are depriving yourself of real happiness because you think you need more. More money, and more stuff. 7. 11 Surprising Things About Becoming a Minimalist. You might expect that when you become a minimalist, you’ll have less stuff and more space, but there are a few surprising things you can look forward to as well. 8. How to Say Goodbye to Guilt. You can let go now. 9. Minimalist Fashion Challenge Project 333 Begins. This is where my little capsule wardrobe project began. It started as a personal challenge and has since been featured on CNN, in O, The Oprah Magazine and is changing closets and lives around the world. 10. The Greatest Secret to Productivity that No One is Talking About. We have to start by redefining productivity, because the current definition is clearly broken. When was the last time you finished everything? What was the last time you thought, “I’m so productive that I got it all done.” and didn’t have to wake up and do it all over again? While I love writing about the practical how-to, I especially treasure the pieces I can write that help us connect heart to heart or soul to soul, because that’s where the real change takes place. It always comes down to love for me. I chose these as my 10 favorite articles based on your response via comments and email, and our connections. I learn so much from you. 1. How a Devastating Diagnosis Taught Me How to Really Live. I often skim over my diagnosis here, because this blog isn’t really about MS. Then again, it’s not about living with less either. I write about decluttering, paying off debt, and living more simply, but those are just little chapters in a bigger book about love, connection, light, and living. Really living. 2. Soulfully Yours. I am here to serve you. Being in service to you is my core purpose, and recognizing that has allowed me to grow in my life and work. Serving you serves me right back. 3. Grief is the Price We Pay for Love. Our dog made us better people. The lessons are only starting to unfold, but loving and losing this dog has shown me that my capacity for joy, love, grief, and pain is so much greater than I had thought. 4. How to Enjoy Your Favorite Things Everyday. Having it all doesn’t require owning it all. Take a look at the things in your life, the things you use every day. Are they your favorite? 5. Declutter and Downsize to Create a Life with Room for What Matters Most. Everything I owned resulted in paycheck to paycheck living, expensive insurance policies to protect it all, decades of debt, weekends of care taking, exhaustion … and the desire for more. I was so caught up in the work-spend cycle that I couldn’t envision another way. 6. 10 Things to Add to a Simple Life. When simplifying your life, the focus is often on decluttering and donating, but there is so much you can add to support a simple life, to build a good life. 7. My Formula for Stumbling Through with Grace. If you read through some of my previous blog posts, it can sound like I really have my act together, but the truth is that I am usually stumbling through. 8. Let the Monkey Off the Chain. Do a quick check right now. Is your jaw clenched? Are your toes curled? Are you holding your breath? Those are the tiny physical signs of the bigger mental and emotional attempt to control the world, or at least your world. 9. Why You Can’t Measure Self Worth by Net Worth. It may seem easier to measure our worth by what we have instead of who we are. We can clearly see what is in our bank account (or not), the material possessions that surround us and the labels we wear. There is a hard and fast equation for our net worth, but that is not what makes us worthy. 10. Hello, I Love You. There are 7,043,513,670 people living in this world. Based on the actions of a small fraction of that number, it’s possible that you’ve become less open to love. Thanks for your 5+ year commitment to encourage us. Thanks for all your continued encouragement!! I am well on my way to being more with less, even though I am still in the process of making the changes. My only regret is that I haven’t done and realized all this sooner ! Please know that you’ve made a difference in my life as I’m sure in many others lives also. Thanks for the list! I’ve read a bunch of these, but I didn’t even know some of these existed. Looks like I’ve got some weekend reading to do! Thanks so much Courtney for all your encouraging comments over the years. One of your blogs that has meant so much to me is “Grief Is The Price We Pay For Love’ written after your beloved Guiness passed away. My lovely boy also passed shortly after that and I have often thought of your compassionate words that you wrote about your time with him. I am so thankful I had almost 16 years with our lab, Bailey – dogs really teach us so much about life – to live it simply and in the moment. I discovered your blog this weekend and spent a lot of time reading your articles, so thank you! I look forward to checking our the best of posts! Thanks for the list. It’s nice to be able to look back at some of the articles I may have missed over the years. Thank you so much for your contribution to your readers life. You are a part of us! Thanks for inspiring me and helping me with your suggestions for my blog! It’s coming up nicely. I only just discovered your blog today and have spent the last few hours reading through and digesting your articles. As the owner of a 14 year old dog I particularly appreciated your piece about grief being the price we pay for love. I am sure I will come back to it when it’s time for me to say goodbye to him.